We had planned to make a loop down through Oklahoma, across the Deep South and back up through Ohio, Minnesota and the Dakotas as part of our annual attempt to miss the least desirable time in Montana, aka Mud Season. However, getting Gary's mother situated in Bozeman and tackling her financial affairs kept us tied down. We finally allowed ourselves some time off for a short trip to visit friends in Edmonton. By June, things were well enough in control to host several guests, and we have a number of trips planned for the rest of the year. Spring is when animals need to take advantage of newly emerging food sources to recover from the rigors of Winter. This moose was checking out the buds on Pauline's bushes. Gary spotted it and chased it off before it could do much damage. Confronting a moose is a dangerous proposition, so he made sure he could beat a quick retreat into the house if the moose decided to defend its tasty treat. Pauline located a long-lost cousin via FaceBook two years ago. This year, cousin Susan and husband Ian came to visit from England and we escorted them on a five day trip to Cody via the Beartooth Highway, then on to Yellowstone Park and Grand Teton Park. We dropped them off in Jackson so they could continue their trip to Nevada and California. Crossing the Beartooth on June 21 (the first day of Summer) temperatures dipped to 30°F and visibility was limited by a blizzard. In Yellowstone Park we were treated to a better than average bison jam (with baby bison and a group of concerned bicyclists). In Grand Teton Park we encountered a group of young bears. 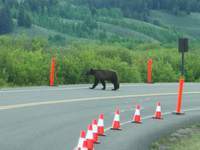 Park rangers had set out traffic cones to slow down traffic because the bears were too close to the highway. The bears decided to cross just as we approached. These youngsters were out for some fun and thought the traffic cones and pylons were great toys. The rangers chased them off when they started to chew up the “toys.” It is difficult to identify juvenile bears; other tourists claimed these were grizzlies, but the ears are prominent and the shoulder hump is missing, which would indicte black bear. On the other hand, the snout is not quite straight and they seem very large for juvenile black bears. We had a thunderstorm that seemed like a minor hurricane on June 29. It was much more impressive here than downtown. One guy made headlines by tubing down the street after the storm passed.